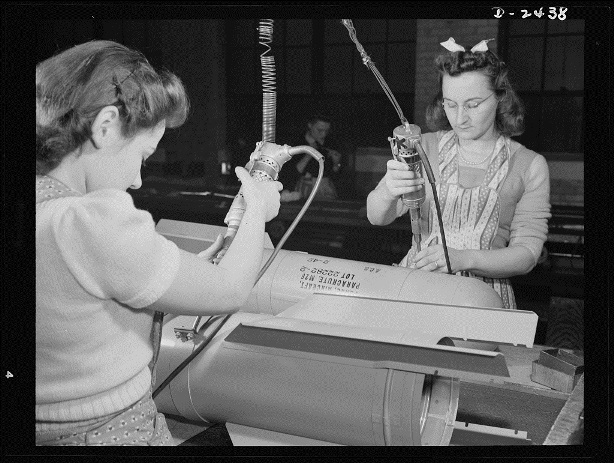 The women and factory depicted in this picture are unknown, but it represents Connecticut’s long held vital role in the nation’s defense industries. Throughout the years, Connecticut’s factories have provided the armed forces with weapons, ships, planes and armaments. World War II was no exception to this tradition. With the outbreak of the war, work orders began to pour into the state, quickly ending the Great Depression. Almost 210,000 Connecticut men and women entered the armed forces, and just fewer than 6,000 of them gave their lives to defend our country. Because so many men enlisted in the military, women were recruited to take their places in the all-important factory jobs that kept the forces abroad supplied. This opportunity represented a chance for women to serve their patriotic duty, in addition to providing an escape from women’s traditional role in the home. More than six million women across the country joined the work force during the nation’s time of need. When the war ended in 1945, the great majority of these women were laid off in favor of the returning veterans. However, the experience opened the door for women in Connecticut and around the country to pursue work outside the home.